At this time, there is no known cure for cholinergic urticaria. Doctors and researchers are still not completely sure about the physiological mechanisms leading to the cause of the cholinergic urticaria condition (heat hives). Therefore, the current focus is how to effectively treat and manage the symptoms of cholinergic urticaria. There are several treatment options doctors have used to treat the hives (urticaria) outbreaks. This page will list some of the most commonly prescribed medications, along with some documented or newer treatment options. Please understand that I am NOT a medical doctor. Please do not attempt to take or stop taking any medications based on the information in this article (or anywhere on the site). Instead, always follow the instructions of your doctor. I am simply writing this information for those that are interested for research or informational purposes. I am trying to do everything I can to help anyone else suffering from this condition. Avoiding situations that cause hives, and/or rapidly cooling themselves down to abort an attack. Wearing appropriate clothing to help keep the body cool (i.e. don’t overdress). Prayer, or using mental relaxation techniques may help individuals cope with attacks or the stress of living with the condition (however, it will not generally cause the reactions to cease altogether, but rather, provides a way to handle attacks emotionally). Use of cooling sprays, ice packs, or other materials may help to quickly resolve oncoming reactions. Avoidance of compounds known to sometimes worsen cholinergic urticaria (such as aspirin, alcohol, prescription drugs, and or illicit street drugs). Exercise or Sweat Therapy— Some individuals use regular exercise as a way to induce frequent and regular attacks, thus, limiting the severity of the attacks. The idea is to force an attack, and force the body to sweat more often and more regularly. It also causes a release of histamine during the attack, which temporarily reduces the histamine levels in the body (which in turn reduces the intensity of the urticaria reactions). This approach works well for some with mild forms of cholinergic urticaria. However, those with the more severe forms (or those with an associated exercise-induced anaphylaxis) may not be able to continue this therapy, or they may need to stop for health reasons. Antihistamines are agents/drugs that serve to inhibit (or prevent) the release of histamine in the body. Histamine is a chemical involved in allergic responses and other biological functions. 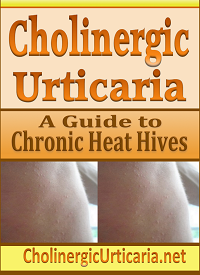 During a cholinergic urticaria (heat hives) attack, histamine is released in the body. This is what causes the “itchy” hives feeling. Many antihistamines can be purchased over the counter in a local drug store or online. Over the counter antihistamines do not require a prescription. Some antihistamines are stronger and require a prescription. These antihistamines listed above are sometimes prescribed to help alleviate the symptoms of cholinergic urticaria. The results may vary for each individual. Some have reported that antihistamines helped dramatically, while others find almost no relief using them. Sometimes antihistamines are used together in different combinations (H1 and H2). They may also be combined with a proton pump inhibitor for better results. Individuals should discuss potential treatment options with a doctor. Different types of steroids are also occasionally used to treat cholinergic urticaria. In most instances, steroids are only used in severe circumstances. Individuals often have mixed results when taking anabolic steroids for cholinergic urticaria. Some individuals experienced remission of symptoms, while some only had temporary relief, and others experienced little or no relief. The most commonly prescribed anabolic steroid is: Danazol. A British dermatological medical journal Blackwell-Synergy.com has published a few articles related to the treatment of cholinergic urticaria with Danazol (an androgen steroid). There was just a small excerpt from the full article. The article suggests that some steroids were effective in reducing cholinergic urticaria outbreaks. Steroids are very serious drugs and are potentially dangerous compounds. They should only be used if your doctor prescribes them. According to most research articles, steroids are only given in fairly extreme circumstances. It may provide relief, but each individual one should weigh the potential harmful long-term effects against any short-term benefit. Corticosteroids are a class of steroid hormones that are produced in the adrenal cortex. Corticosteroids are involved in a wide range of physiologic systems such as stress response, immune response and regulation of inflammation, carbohydrate metabolism, and protein catabolism, blood electrolyte levels. Corticosteroids can come in various forms such as creams, pills, shots, etc. It is commonly prescribed in lotion form to help with skin inflammation and eczema conditions. In addition, corticosteroids are sometimes used to treat severe cholinergic urticaria symptoms. Read more about corticosteroids for cholinergic urticaria. Prednisone is a type of corticosteroid that is sometimes prescribed for various immune-related diseases. It has been prescribed for some sufferers of cholinergic urticaria. Prednisone tends to have an immune suppressing effect, meaning it lowers your immune system response. Prednisone has also been successful at preventing some of the symptoms related to cholinergic urticaria. Just like other steroids, they are typically prescribed by a doctor in more severe cases. Do not take this medication unless prescribed by your doctor. Also, prednisone may have serious side effects or long term effects, so talk to your doctor about any potential risks involved. Ciclosporin is another immunosuppressant drug that is sometimes prescribed for urticaria. Beta blockers typically block the action of endogenous catecholamines (epinephrine (adrenaline) and norepinephrine (noradrenaline) in particular), on β-adrenergic receptors, part of the sympathetic nervous system which mediates the “fight or flight” response. Propranolol has been prescribed in an attempt to help treat the condition of cholinergic urticaria (hives). Again, some people have reported some relief with this treatment as well, while others found it ineffective. Again, if your doctor prescribes this, you may want to talk about any harmful side effects and weigh those against any potential benefit. UVB light therapy is also sometimes used to treat cholinergic urticaria. Some individuals have reported that regular UVB light therapy reduced or even eliminated cholinergic urticaria symptoms while the treatment was ongoing. This treatment is often given by dermatologists or skin specialists. Some patients experienced a return of symptoms once the treatment ceased. Consistent exposure to UVB light can increase cancer risks, skin aging, and other factors. Talk to a doctor to learn more about the risks, and benefits of this therapy. Scopalamine Butylbromide is an anticholinergic/antispasmodic medication. This is sometimes prescribed to treat cholinergic urticaria because it can help prevent cholinergic activity. Like all other treatments, this varies in its effectiveness as a treatment. Some individuals treated experienced a large reduction in symptoms, while others did not. This is a relatively newer treatment used in many different type of allergic and asthmatic conditions. This medication works by binding to Immunoglobulin E in the body. Immunoglobulin E is responsible for allergic inflammation. Therefore, this medicine seeks to reduce the number of IgE compounds in the body. Read more about Anti Immunoglobulin E for Cholinegic Urticaria. Some studies suggest mixed results with cholinergic urticaria. Some people were successfully treated, while others did not respond well. This is a relatively newer drug, and more research is needed to ensure safeness. Some have suggested a potential cancer risk in using this drug, as well as other side effects. Always consult your doctor to find out more information. Some individuals may be treated with medicine that affects the nervous system. One such medicine is GABAPENTIN, which is sometimes used in the treatment of anxiety, epilepsy, and other conditions. This is a relatively new and experimental form of treatment for Cholinergic Urticaria. There is not yet enough data to know if this treatment is effective or safe to use in treating this condition. Doxepin is another drug sometimes prescribed that has anti-anxiety properties, in addition to anti-histamine and anti-depressant qualities. Singulair is a medicine sometimes used to treat chronic hives, or asthma. Individuals with cholinergic urticaria may experience bouts of depression, social anxiety, and more. Anti depressant medications may be given to temporarily treat any associated depression, anxiety, and related symptoms. So far, it appears that anti-depressant medication does not directly help symptoms related directly to cholinergic urticaria, however, some individuals have noted an improvement. Because antidepressants are a very serious medication that can alter thinking patterns and brain interaction, it is recommended that you seek safer treatments first. One anti-depressant used is doxepin, which has both antihistamine and antidepressant properties. See: Doxepin for hives. To ensure there is no active (hidden) infection causing the hives, some doctors have prescribed a course of antibiotics. In most cases, these did not resolve the cholinergic urticaria symptoms. However, in at least one case reported, an individual reported symptoms resolving after a course of antibiotics. However, more research would need to be conducted to rule out coincidental remission, which happens very frequently with cholinergic urticaria. This condition often spontaneously disappears, which can lead one to believe it was the result of the treatment (which may not be the case). Some doctors may prescribe anti-fungal medication if he or she suspects the symptoms are related to a fungus. Cholinergic urticaria has no known association with any active fungal infections, therefore, this treatment generally provides no benefit for cholinergic urticaria patients. Some individuals may be prescribed an anti-itch lotion. These generally provide very little benefit to cholinergic urticaria sufferers, as the itch from cholinergic urticaria is a result of mast-cell degeneration in response to acetylcholine release, and most of these lotions are formulated to help with generalized itching. Some lotions or creams may help to moisturize, cool, and/or soften the skin. This can be beneficial to individuals with cholinergic urticaria, as their skin often feels uncomfortable and dry. Some of these lotions include Aveeno Anti-Itch Concentrated Lotion or Eucerin Calming Cream. You can purchase these lotions online or at your local retail store. However these lotions, will not stop hives attacks, and only serves to ease the discomfort of general skin dryness. Alternative treatments often have little to no impact on treating cholinergic urticaria. Here is a brief video warning of some of the bogus treatments mentioned. Unfortunately, most individuals with cholinergic urticaria have reported little or no benefit from trying these approaches. Some feel that acupuncture can help one to mentally cope with the disorder. However, none of the treatments have ever been scientifically proven to help cholinergic urticaria. Some of these may actually make cholinergic urticaria worse. I also just want to briefly say again that I am NOT a doctor. Please do not confuse anything I say on this website at medical advice. Period. You should always consult with a medical doctor before trying any medications, or stopping any medications. While I always strive to be as accurate and clear as possible, some information on this page may be 100% accurate.